The year is 1648 and life in Venice is serene for Isabella Hawkins and her friends Willem, Al-Qasim and Signora Contarini. Together they publish fine books like the controversial encyclopaedia, The Sum of All Knowledge. When a new Inquisitor declares war on free speech however, they are forced to flee across the seas to the wondrous capital of the Ottoman Empire, Constantinople, which is ruled by the infamous Sultanate of the Women. Old friends and new, including the boy Sultan and his sister, welcome them to the world′s greatest city. But Isabella is soon entangled in poisonous palace intrigues, while her friends secretly play perilous games of their own. Sixteen-year-old Isabella Hawkins has experienced much sorrow in her time – first fleeing from England with her scholar father when The Tribunal of the Holy Office of the Inquisition (aka ‘The Spanish Inquisition’) rode throughout the land, upholding Catholic orthodoxy by any means necessary. Isabella and her father tried to flee to Amsterdam; but only Isabella arrived, orphaned after losing her father to the bitter seas. But the Inquisition, and one Holy man in particular called Fra Clement, was never far behind. While in Amsterdam Isabella befriended and began working for a scholar called Master de Aquila and his young printing apprentice, Willem. But Fra Clement and his Holy order came again – and Master de Aquila was lost, trying to preserve the writings of Isabella’s father in ‘The Sum of All Knowledge’. But Isabella and Willem kept running and eventually found peace and acceptance in 1640 Venice, where we last left her, having found a new happiness for herself working for Signora Contarini’s Mermaid Press. Now the year is 1648, and Isabella has known true happiness and beauty in Venice where she works with her friends – Signora Contarini (Valentina), Willem, Luis and Al-Qasim – and is again surrounded by books. But when invitations arrive, inviting everyone to the Doge’s Palace, the past begins to stir and trouble lurks . . . and Isabella is again confronted by the Inquisitor, Fra Clement, whose Holy campaign has now stretched to the intellectual, artisan capital of the world – beloved Venice. Clement has been following Mistress Hawkins for all these many years, hell-bent on bringing her godlessness to justice. Isabella and her friends accept there is nowhere in Christendom they will be safe from the Inquisition, at least not for people like them who have dedicated their lives to the pursuit of knowledge. So they decide to escape, to the Ottoman Empire and Constantinople. This is a strange new land indeed, and only ex-pat Al-Qasim is wary of what lurks in their new sanctuary. All seems well to begin with, especially when the eight-year-old Sultan Mehmed IV reveals his love for ‘The Sum of All Knowledge’. But eventually Palace politics intrude on the group’s new refuge, and each of them must play a delicate game to keep their lives and guard their secrets . 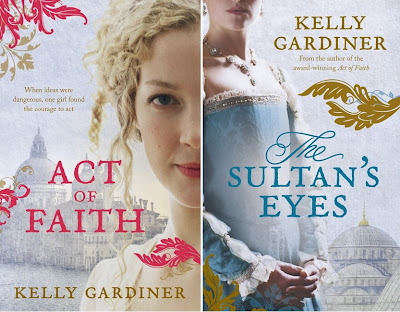 . .
‘The Sultan’s Eyes’ by Australian young adult author Kelly Gardiner is the continuing tale of Isabella Hawkins’s thrilling life; sequel to the 2011 novel ‘Act of Faith’. This really shouldn’t come as a surprise, since I fell in head-over-heels love with first novel ‘Act of Faith’ and have been desperate for Isabella’s continued tale since I first heard that Gardiner had more in store for my favourite Philosopher and Adventurer. ‘The Sultan’s Eyes’ does not disappoint, and has been well worth the two-year wait. When the novel begins we are offered only a small glimpse of what Isabella’s life has been like since we last left her, content and working with books once again, in beautiful Venice. 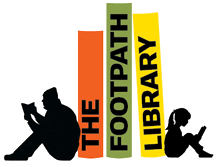 We see that she has kept herself surrounded by the same people she met and befriended in ‘Act of Faith’, and now this group of bibliophiles and knowledge-pursuers have become a family. But just as quickly as we are reacquainted with Isabella, we are running with her again when The Inquisitor turns his raid on Venice – a city full of intellectuals and artists, and ripe for the Inquisition’s orthodoxy. And when Christendom is not safe, the group turn to Constantinople and the Ottoman Empire for refuge. Now, my heart gave a thrilled little flutter at Isabella and Co. venturing to Constantinople (now, Istanbul) because I have plans to visit there very soon. And now, more than ever, I want to see this beautiful and chaotic city because Gardiner’s descriptions are mouth-watering. Indeed, nobody evokes place and history quite like Gardiner for me – it’s not just her describing the many towers of the Byzantine city, or the silk burqas Isabella and Valentina wear. It’s in her describing the feel of the city –particularly through the eyes of Dutch Willem and British Isabella for whom this place is so wholly foreign, caught between Europe and Asia and unlike anything they have ever seen or experienced before. 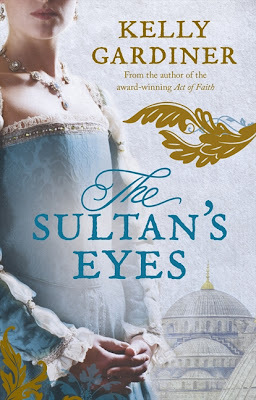 ‘The Sultan’s Eyes’ is also a much bigger book than ‘Act of Faith’, where that first book came in at 227-pages, Isabella’s new adventure is a satisfying 334. And most of the book does take place in Constantinople; a much different plot which doesn’t see Isabella escaping and on-the-run, so much as plotting and surviving within the Sultan’s palace. Eight-year-old Sultan Mehmed IV is a precocious and driven young man. He has dreams of one day being greater than Alexander the Great, and when Isabella seeks asylum on his shores he thinks he’s found a way to start his process to Greatness by turning her into a sort of Scheherazade . . . I loved that Isabella and her friends were mostly settled in Constantinople, and the crux of the story is about them surviving Palace life. I would say that ‘Act of Faith’ was about Isabella the Adventurer – ‘The Sultan’s Eyes’ lets us see Isabella the Philosopher. 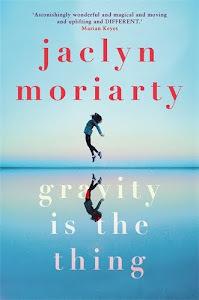 We get a chance to see her dodge Palace politicking and untangle webs of lies, and we see how Isabella’s moral compass has developed through the years spent running and hiding from one man’s vengeance and misguided faith. In this book, we see how the years have shaped Isabella into a kind and determined young woman. This is never more apparent than in her caring for the Sultan’s sister, Ayşe, whom she insists be educated by Isabella right alongside her brother. The whole book is an opportunity to know the family Isabella has surrounded herself with, those she collected along the way in ‘Act of Faith’ and who she remains steadfastly loyal to. I loved reading about Willem’s dogged pessimism, Valentina’s strength and a small a spark of something between Luis and Al-Qasim. These are some beautiful characters who complement Isabella, and make it easy to see how she’s been shaped into the young woman she is today. Gardiner’s second book for Isabella ends exactly the way I wanted it to – full of wide, open spaces and endless possibility – which is just what I had hoped for my favourite Adventurer & Philosopher. We’d been with her through the fear and heartache of ‘Act of Faith’, and in ‘The Sultan’s Eyes’ we see what those trying years have moulded her into – this brave and cunning young woman who is loyal to a fault and exactly the kind of heroine I want all girls to be reading. Labels: Aussie YA, Australian Women Writers, Kelly Gardiner, YA. Oh my goodness, those illustrations are beautiful! 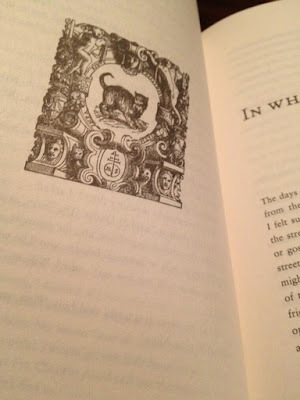 Thanks for that little peek, I always love seeing photographs of beautiful book design. 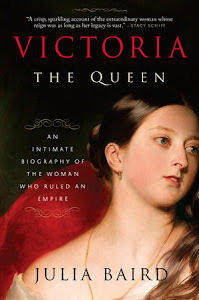 I have a hit or miss relationship with historical fiction, but this series sounds really lovely. You'd love this! Kelly is at Melbourne Writers Festival this week and one of her talks is on 'Strong Women' - nuff' said, right? Hi Danielle, I really enjoyed your blog post. I loved The Sultan's Eyes, and am now keen to read Act of Faith too. And aren't they gorgeous covers? 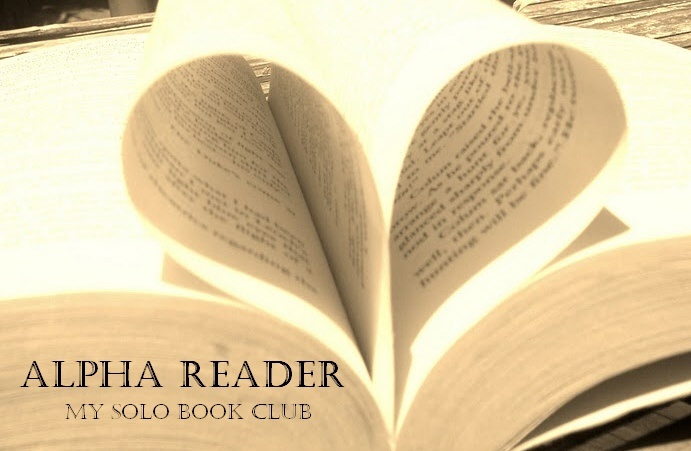 Wonderful books, you'll love them. And the covers are stunning - but also, wait till you see the chapter-header pictures. Gorgeous!